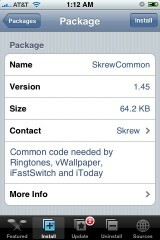 The update to Skrew Common and iToday, add some nice new features to the application. In the Settings menu, you will notice that the Display Settings option is now available. If you select it, you are brought to a screen in which you can disable (by tapping); Information (missed SMS/Calls icons, battery, temp. 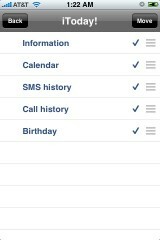 ), Calendar, SMS History, Call History and Birthday. If you disable one of the options, it will not show up on your lock screen. 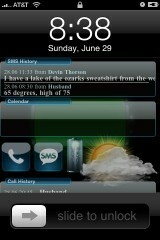 You are also able to change the order in which they display on your lock screen. If you tap, hold and drag the three bars to the right of an options, you can then move it where you would like it. The order they are in the settings is the order they will display on your lock screen. Also, if you would only like a vWallpaper on your lock screen and no other information, just disable all the display options. 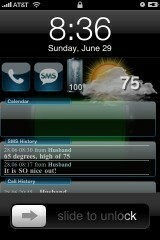 The developer has also added a longer delay before the lock screen goes into sleep mode…which is nice. The only issue I noticed is that if you move the Information option off of the top, where it normally is, it doesn’t display the battery percentage or the temperature. The icons are there just no numbers on top of them. Both Skrew Common and iToday are available through the Skrew source. It is getting there. Being free it gets the job done, but it is still not as polished and eye pleasing as intelliscreen is. If you move the information from the top spot, the numbers are shown, but they are misaligned. They end up showing much lower than the information graphics. So if you move the information in the middle, the numbers will be displayed on top of whatever is below it. It’s a pretty nice program (especially since they’re not charging), but like palak said, it still needs some polishing. My Ipod crashed after i installed the new iToday! My probleme is i can´t do anything on my ipod and i cant SSH it.